Round in Superleague means a new league leader. 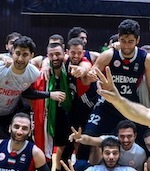 The biggest surprise took place in Tehran where host Chemidor (12-1) beat league's leader Petrochimi (12-1) 82-67 on Monday evening. It ended at the same time the 11-game winning streak of Petrochimi. It was a key game for the top position in the league. Chemidor have an impressive 12-game winning streak. They keep a position of league leader, which they share with defeated Petrochimi. Petrochimi will play next round against Zob Ahan trying to make it back to the top of the standings. Chemidor will try to continue on its current victory against fourth ranked Shahrdari Gorgan on the road. Eighth-ranked Pegah Tehran (2-11) made lots of trouble for third ranked Naft Abadan (10-2). The visitors from Abadan managed to secure only two-point victory 74-72. However their fans expected much easier game. Naft Abadan have an impressive five-game winning streak. They maintain third position with 10-2 record having just three points less than leader Chemidor. Pegah Tehran lost fourth consecutive game. Newly promoted team keeps the eighth place with 11 games lost. Naft Abadan will play against bottom-ranked Raad (#9) in the next round where they are favorite. Pegah Tehran will have a break next round. Bottom-ranked Raad (0-13) tried to put together a comeback for its first victory of the season, but they fell short in the 92-65 loss to fourth ranked Shahrdari Gorgan (8-4) in on Monday evening. Shahrdari Gorgan have a solid four-game winning streak. They maintain fourth position with 8-4 record. Newly promoted Raad still closes the standings with 13 games lost. Shahrdari Gorgan will meet at home league's leader Chemidor in the next round and it may be the game of the week. Raad will play against Naft Abadan (#3) and hopes to get finally their first victory. In the last game of round 14 Mashad was defeated by Zob Ahan in Esfahan 89-85. There was no surprise in Esfahan where 7th ranked Mashad (2-10) was defeated by fifth ranked Zob Ahan (6-6) 89-85 on Monday. Newly promoted Zob Ahan maintains fifth position with 6-6 record. Mashad lost fifth consecutive game. Mashad at the other side, also newcomer in the league, keeps the seventh place with ten games lost. Zob Ahan will meet league's second-placed Petrochimi in the next round and it may be quite challenging game. Mashad will play against Army (#6) and it may be a tough game between close rivals.